The building was conceived and designed by Alfred I. Coffey, a native San Franciscan, during his service from 1910 to 1912 as city architect. His firm had a strong reputation for designing schools, hospitals and other public buildings. Coffey’s short tenure as city architect meant the construction of the North End Station was overseen by his successors John Reid Jr., Frederick Meyer and John Galen Howard, who had been appointed to focus on redesigning the Civic Center. Reid guided the city’s many post-earthquake school projects. 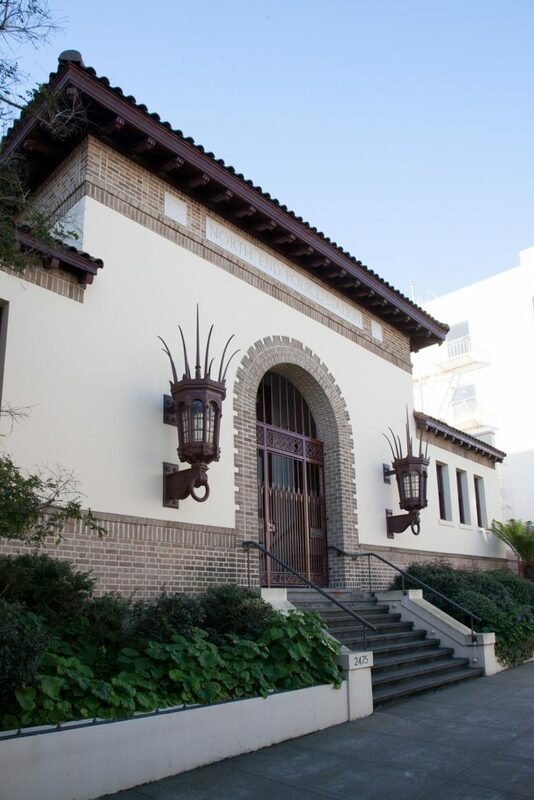 The neighborhood police stations of the 1910s brought the formal architecture of the Civic Center and the Pan-Pacific Exposition into the city’s residential neighborhoods. The Richmond, Park, Potrero, Ingleside and Harbor stations were included in this campaign. Both the station and its matching garage have been converted to private use. The building, which is in course of construction, has a handsomer exterior than is usually looked for at a police station. The design is in the Italian Renaissance style, with low red tile roofs and wide spreading cornices, supported on hand-carved wood brackets. The brick walls are covered with a rough-cast cement and the openings and details are brought out in colored brick and ornamental tiles and marbles. Two ornamental iron lamps are placed on each side of the main entrance and additional light will be furnished by four ornamental light standards set on the coping walls, which will surround the lawn and terrace. The station had quite a colorful history. In the early 1920s, in what could be straight out of a Hollywood script, a Chronicle headline screamed: “Police Scandal Breaks in McDonough Liquor Case.” The ensuing story detailed the tension between two North End Police Station officers and the liquor distribution ring that was reportedly circling around the station. Prohibition brought many challenges to the police department, including ensuring their own officers were not caught up in liquor smuggling schemes. The McDonough case pitted officer against officer, with one officer’s son testifying against the McDonough brothers, who were on trial for bootlegging liquor. After World War II, the North End Police Station was converted into the Police Juvenile Bureau, focusing on incidents involving the city’s youth. The building retained this use for some years, and was also used by the Police Activities League, but was essentially abandoned by the 1980s. In the mid 1990s, the city finally de-acquisitioned the property, and the Planning Commission approved a conditional use permit to convert both the station and its matching garage to private use. The building was also designated then as a city landmark. The adaptive reuse maintained features unique to the police station. 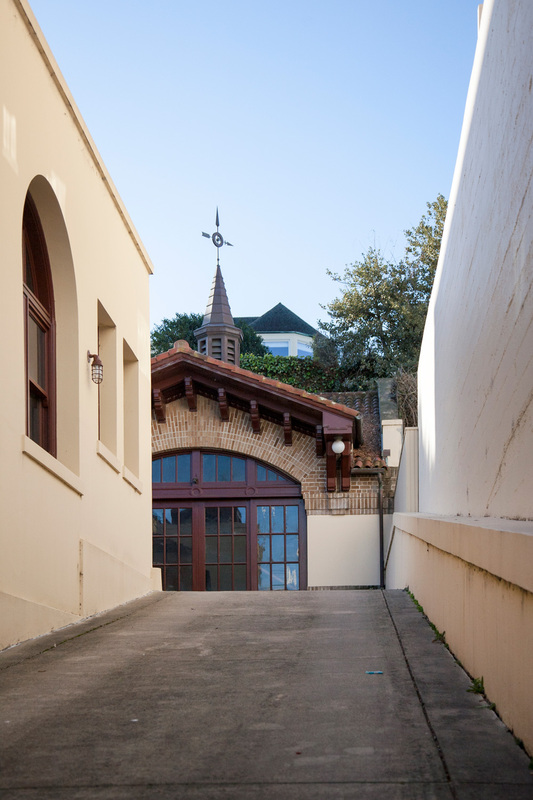 Taking a creative approach to the adaptive reuse of the historic station, the current owners hired San Francisco architect David Gast to guide the project. 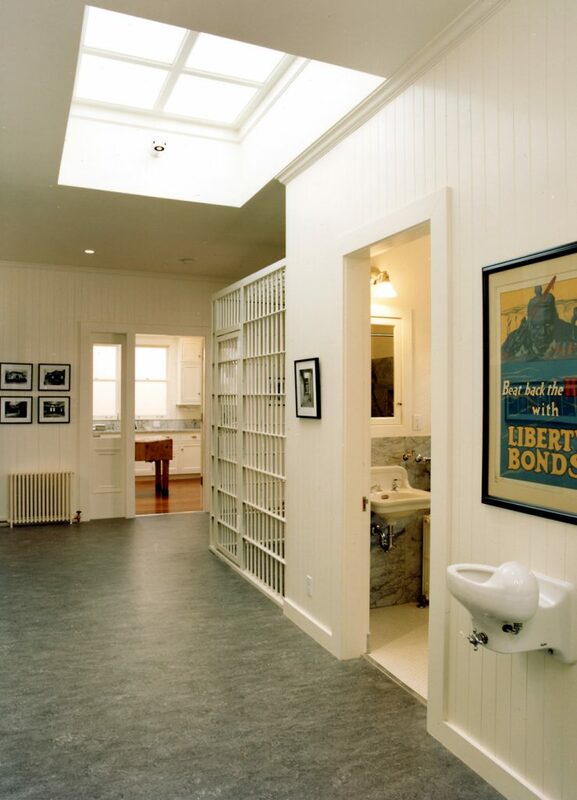 Accommodating both a residence and the owner’s art studio, the reuse included maintaining a number of features unique to the police station such as the prisoner cell, water fountain, skylight in a main room, marble features of the restroom, the rotating garage mechanism to turn cars around, the North End Police Station sign above the entry — and the magnificent light fixtures on both sides of the entrance. The building has been lovingly maintained. Its presence in the neighborhood is a reminder of both the 1915 exposition and the city’s extensive rebuilding efforts after the 1906 earthquake and fire.